In 1922 the British colonial government in Uganda founded a small vocational school, which would eventually become Uganda’s lone institution of higher education, Makerere University. The British Governor of Uganda, Robert Coryndon (1918-1922), proposed building a technical school for Africans. The Colonial Office and the Imperial Treasury in London accepted his proposal. In late 1921, however, local educational advocates had established a school to teach basic carpentry and mechanics in a temporary location on Makerere Hill in Kampala, the colonial capital. The Colonial government decided to make the site the permanent location of Makerere School. By the end of 1922, the first class of fourteen students, seven enrolled in carpentry, and seven enrolled in auto mechanics, began their training. By 1925 there were seventy-six students enrolled in Makerere to receive vocational training. British governor Philip Mitchell (1935-1940) proposed moving Makerere beyond vocational training and expanding it to become the center for higher education in British East Africa (Kenya, Tanganyika, and Uganda). In 1937 Makerere began to offer post-high school certificates. 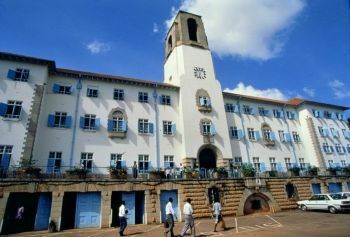 The University of London, whose recognition of Makerere’s academic program was crucial to its legitimacy as a post-secondary institution, initially refused to certify its curriculum. Finally in 1949 the University of London affiliated with Makerere. In 1963 courses taken at Makerere could count toward a degree at the University of London and its students were listed as graduates of the British institution. By 1970, Makerere became the independent university of the Republic of Uganda, offering both undergraduate and postgraduate courses toward its own degree programs. Soon after Uganda gained independence from Great Britain in 1962, Makerere University hosted its first significant international gathering, the first African Writers Conference. The conference was a milestone in African literature dealing directly with the legacy of colonialism. It attracted a number of African writers such as Chinua Achebe and Wole Soyinka who would eventually become internationally famous. It also helped spread the institution’s reputation beyond East Africa. By the mid-1960s Makerere University was the largest and most distinguished university in Sub-Saharan Africa. Although Makerere was neglected during the rule of Idi Amin in the 1970s and affected by the civil wars that followed his ouster, Makerere University never closed. It remains an active research and teaching institution. In 2009, approximately 30,000 undergraduates and 3,000 graduate students attended Makerere University. J. E. Goldthorpe, An African Elite: Makerere College Students, 1922-1960 (Nairobi: Published on Behalf of the East African Institute of Social Research by Oxford University Press, 1965); Margaret MacPherson, They Built for the Future: A Chronicle of Makerere University College, 1922-1962 (Cambridge: Cambridge University Press, 2009); Nizar A. Motani, “Makerere College 1922--1940: A Study in Colonial Rule and Educational Retardation,” African Affairs 78:312 (July 1979). J. E. Goldthorpe, An African Elite: Makerere College Students, 1922-1960 (Nairobi: Published on Behalf of the East African Institute of Social Research by Oxford University Press, 1965); Margaret MacPherson, They Built for the Future: A Chronicle of Makerere University College, 1922-1962 (Cambridge: Cambridge University Press, 2009); Nizar A. Motani, “Makerere College 1922–1940: A Study in Colonial Rule and Educational Retardation,” African Affairs 78:312 (July 1979).